Colin Andrews may not exactly be a household name (in your household maybe, though in mine he certainly is), but he is probably the world's leading authority on crop circles, those sprawling, mysterious but undeniably beautiful designs that have appeared overnight in countless farm fields largely across the English countryside (and to a lesser degree around the world, including the United States). Who made them? Well, that depends on who you ask. Many are satisfied that the circles are the harmless artistic works of clever hoaxers, while many others look to the skies and beyond for the answers. Others still, like Andrews, while looking for otherworldly explanations, use science as a basis for many of the theories. 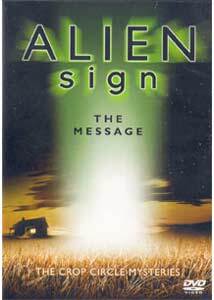 Waterfall Entertainment's Alien Sign—The Message: The Crop Circle Mysteries focuses on one of Colin Andrews' many lectures on the subject (when or where, however, is not listed anywhere on the disc). An electrical engineer by profession and a former senior official in British regional government, Andrews is best known as a researcher and author (Crop Circles: Signs of Contact) on the subject of crop circles, as well as the founder of Circles Phenomenon Research International, the first organization established specifically to investigate the phenomenon. Don't expect a slick, glossy tour of crop circles here, though. What we get is tantamount to watching a poorly shot lecture (complete with slides) of a college professor, as the lighting and sound are often distractingly sub par. Wisely though, Andrews' hard-to-view slides have been replaced here by actual photos, so at least some portion of the visuals are consistently decent. The photos are generally crisp and colorful, and are pleasing to look at if even if you tune out Andrews. Also included as part of his presentation is the infamous "orb" video footage, which purports to show the actual formation of a crop circle by a trio of floating white lights. Once I realized that the entire 64 minutes of Alien Sign was just going to be Andrews' lecture (and not an on-location tour of crop circle sites), it was eventually easy to settle in, relax and absorb the material; that is where this release really excels. He's not the most polished speaker, but as he discusses "plasma vortexes" and "cellular anatomic changes," it was difficult not to get swept up in his explanations and obvious extensive knowledge of the subject. Even his segment on the use of musical notes as some sort of an alien language translative tool, weird though it may be, was nothing if not interesting. It would be easy for naysayers to casually dismiss Andrews as a crackpot, but it's worthwhile to note that this disc showcases him addressing the material with a gentle and unwavering scientific demeanor; the man is not prone to completely wild speculative leaps of logic, and his arguments (no matter how strange they may seem) appear well thought out and are based in part on some level of actual scientific principle. Much like the message of Fox Mulder's poster deep in the bowels of The X-Files, I want to believe. Colin Andrews already does. Image Transfer Review: This disc is presented in 1.33:1 full-frame, and the image quality varies depending on whether it is footage of Colin Andrews or of actual crop circles. The bulk of the material was recorded on what appears to be a hand-held video camera at a dimly lit lecture given by Andrews, and the footage is dark and rather grainy. Full color photos (as well as occasional video) are intercut during Andrews' lecture to mirror what he is talking about, and these feature colors that are comparatively full and bright. Audio Transfer Review: The PCM audio track is mediocre, though the negative aspects are more a result of how the material was recorded than any fault of the transfer. The opening narration and subsequent music cues used at chapter breaks sound full and clean, but the Colin Andrews lecture has a poorly recorded, distant sound to it at times. The coughs and throat-clearing of audience members are sometimes louder than the speaker, and that is a minor distraction. Extras Review: Surprisingly there is no Colin Andrews bibliography, which seems like it would have been a natural extension of the material presented. What's here is minimal, with a 40-image Photo Gallery (most of which are seen during the actual feature) as the only real extra. The disc is cut into a healthy 29 chapters, and it does not feature any subtitles. If the phenomenon of crop circles have an intriguing hold on you (or if you just always thought Mulder was right), here's some material that should appease. Host/author Colin Andrews is one of the subject's leading experts, and while his presentation is sometimes dry as a piece of week-old toast, it is what he is saying that will slowly seep in as being, if nothing else, completely unnerving. The image quality on this disc leaves a little to be desired, but the merits of the material far outweigh it. This disc is budget priced, and is recommended for students of what many consider to be one of the world's (as of yet) truly unexplained mysteries. Recommended for fans of all things alien.